WEST LAFAYETTE, Ind. — Researchers have created the most accurate picture of Zika to date, finding probable drug-binding pockets on the surface of the virus and paving the way for vaccine design. 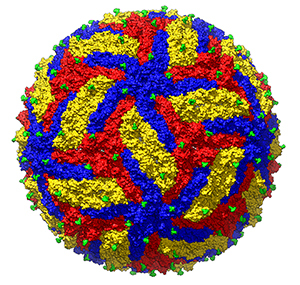 Purdue researchers were the first to discover the structure of Zika virus in 2016. Using cryo-electron microscopy (cryo-EM), they created an image of the virus at a resolution of 3.8 Ångstrom, a unit used to express the size of atoms and molecules. Now, they’ve scaled that number down to 3.1, bringing them even closer to seeing atomic details of the virus. The findings were published in the journal Structure (Cell Press). “Our team extended and optimized the routine crystallographic refinement methods,” Rossmann said. Zika virus belongs to the family of flaviviruses that are transmitted by mosquitos and ticks. Rossmann’s team compared the new Zika structure to other flaviviruses such as Dengue, West Nile and Japanese Encephalitis virus, which are structurally similar but cause different disease symptoms. Zika virus causes babies to be born with abnormally small heads and sometimes smaller brains, a condition known as microcephaly, and may result in Guillain-Barre syndrome in adults. Dengue fever, on the other hand, causes flu-like symptoms and a skin rash. The research team was advised by Rossmann and Richard Kuhn, the Trent and Judith Anderson Distinguished Professor in Science at Purdue. Researchers from Fudan University in China also contributed to this work. Funding was provided by the National Institutes of Health (grants AI076331 and AI07355).